It’s a city better known for its skyscrapers and suits but Hong Kong Island is still an island and you can be out of Central and in your sandals on the sand in thirty minutes. Hong Kong has some fantastic and often overlooked beaches – golden stretches of sand that are the perfect place to broil amidst the humidity. And while the best beaches are found in the wilder stretches of the New Territories and the far-flung islands, Hong Kong Island also has some top spots to pitch your sandcastle. And the best of the five below? Head for Turtle Cove – it’s worth the work. Hong Kong’s most popular beach thanks to it being a hop, skip and a jump from Central, Repulse Bay Beach has a decent spread of golden sand to sunbathe on. 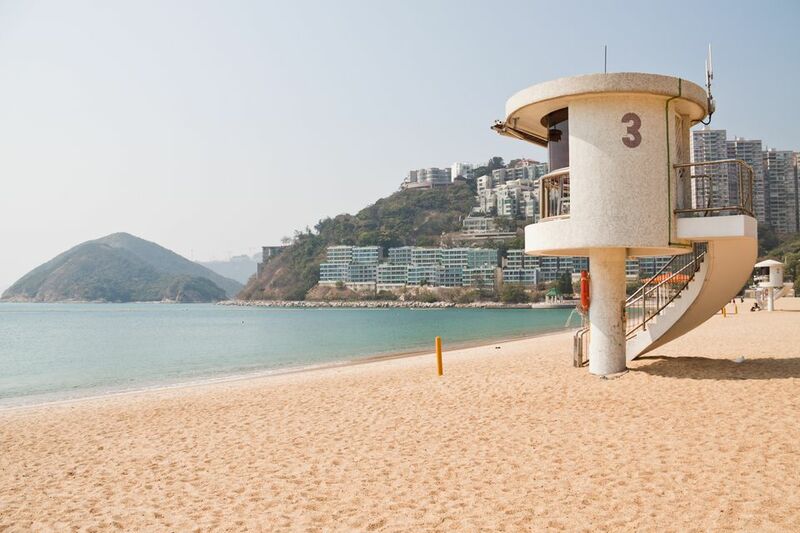 While water quality around Hong Kong Island beaches is generally suspect, the waters around Repulse Bay Beach are particularly murky and you may not want to dip your toes in let alone your head – although plenty of people do. How to get there: You can grab either the 6X or the 250 from Exchange Square in Central – the 6X is faster. It’s a 30-minute journey. Only for the dedicated sun seeker. Turtle Cove in Tai Tam is the best beach on Hong Kong Island. It’s a glorious stretch of golden sand hemmed in by bucolic greenery on all sides with just a palm tree or two for shade. How to get there: You’ll need bus 14 from Sai Wan Ho MTR station. Get off the bus just after the Tai Tam Reservoir and look for the steep steps that lead down to the beach. Hong Kong’s very best seaside town, Stanley is full of seafront promenades, alfresco restaurants and drinks stuffed with umbrellas. It’s also got a pair of beaches. Stanley Beach is a narrow strip of sand that is closer to the town and offers access to watersports and other facilities. If you don’t mind walking a little further (15mins), St Stephen’s beach is a little smaller but usually quieter. How to get there: Frequent 6, 6A, 6Z and 260 buses run from Exchange Square in ​Central and take around 45 mins to reach the village. Despite the name (and the fact that Hong Kong’s nascent surfing community paddle around in the water), this isn’t Hawaii and you won’t find any grand waves crashing the shoreline. That doesn’t mean that Big Wave Bay isn’t worth a visit! Just a few minutes walk from the expansive Shek O Beach, Big Wave Bay is one of the bigger and better stretches of sand on Hong Kong Island, enclosed in a cove fringed by wild hills. Found on the south of the island, it also offers slightly cleaner water quality if you fancy a dip. While the nearby village of Shek O is enjoyably ramshackle and the bare bones restaurants attract a laid-back crowd, the beach itself is often packed with millionaires and other show-offs. Be warned about the bling. How to get there: Take the MTR to Shau Kei Wan station where you can hop on bus 9 to Shek O. Disembark at the junction of Shek O and Big Wave Bay Roads, then walk for 10 minutes to the beach. This stretch of sand is Hong Kong’s unofficial LGBT beach. Located next to Repulse Bay Beach, Middle Bay Beach is a little harder to access than its popular (and straighter) cousin. Thankfully, the more difficult access means that less crowds come here, all the better if you’ve come to cruise, or even just to watch the beach and its denizens. How to get there: Take Bus 6, 6A, 6X, 66 or 260 from Exchange Square Bus Terminus and get down at Repulse Bay. From there, walk south to Middle Bay Beach.